Antelope are in the bovine family. They are related to cows, sheep and goats. More than 90 species of antelope live in Africa and Asia. The pronghorn antelope lives in western America and Mexico, but it’s not really an antelope. Pronghorns lose their antlers every year like deer. True antelope keep their antlers. All About Antelope: Antelope are in the bovine family. They are related to cows, sheep and goats. 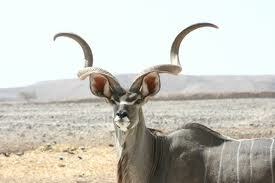 Speaking of horns, antelope horns are beautiful and interesting. Kudu antelope have antlers that grow in spirals. 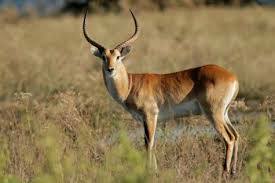 The impala antelope has ridged antlers. Other antlers, like those of the wildebeest, are curved and sharply pointed. Kudu antelope have antlers that grow in spirals. Antelope are herbivores. They graze on grass or munch on leaves. They’re smart. They follow the rains to find tender grass. Some follow zebras because the zebras eat the tough outer grasses, leaving tender, young grass for them. Antelopes have hooves made for their habitat. The klipslinger antelope has tiny suction-pad like pads on its hooves to help it climb steep rocks. Antelope that live in the desert have wide, flat hooves to help them walk on the sand. Duikers antelope sometimes eat bugs or even small birds. Other antelope can stand up on their hind legs to get to the leaves in trees. 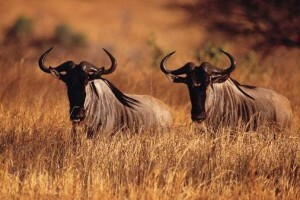 The wildebeests are antelopes that have curved and sharply pointed horns. 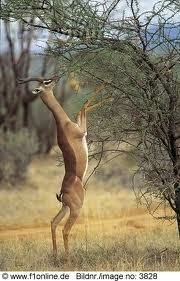 Antelope can stand up on their hind legs to get to the leaves in trees. A video footage of antelopes fleeing from a cheetah and jumping into a car. Question: How do antelope mothers protect their babies from predators? Answer: Most antelope species hide their babies in long grasses or shrubs until they’re old enough to join the herd. Question: Do antelope always live in herds? Answer: Usually, but some species live alone. Antelope are more likely to live alone if food is scarce. Enjoyed the Easy Science for Kids Website all about Antelope info? Take the FREE & fun all about Antelope quiz and download FREE all about Antelope worksheet for kids. For lengthy info click here.